NEW YORK -- Marvin Bagley III had 33 points and 17 rebounds, Grayson Allen made his first five 3-pointers and No. 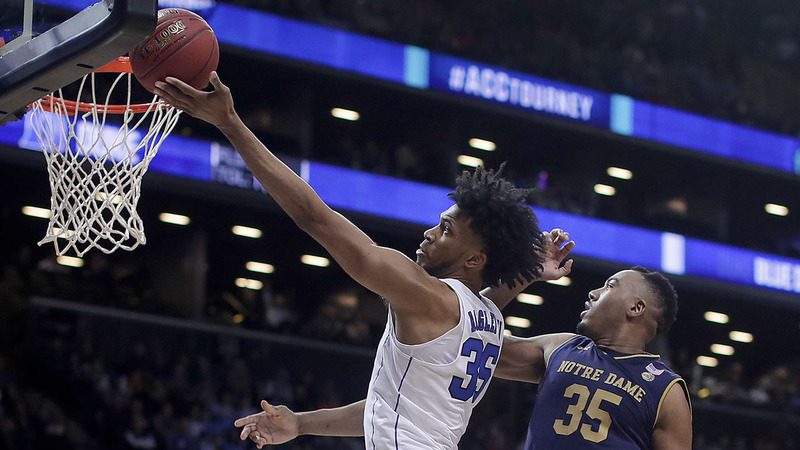 5 Duke rolled to an 88-70 victory over Notre Dame in the Atlantic Coast Conference Tournament quarterfinals Thursday night. Allen finished with 23 points and the second-seeded Blue Devils (26-6) advanced to play No. 3 seed Miami or 12th-ranked and sixth-seeded North Carolina in the second semifinal Friday night. Duke, the defending champion after beating Notre Dame in the title game last year, earned its 100th ACC Tournament victory. Bonzie Colson had 18 points and nine rebounds for the 10th-seeded Fighting Irish (20-14), who were unable to score the marquee victory over a top team that might have been a huge boost to their NCAA Tournament resume. Injuries to Colson and senior guard Matt Farrell derailed Notre Dame in the middle of the season, and now the Irish have to hope the selection committee focuses on how good they can be when healthy. The undersized Fighting Irish had no answer for Bagley's size and athleticism in the lane. The freshman phenom and ACC Player of the Year came within one point of his career high set against Texas in late November. It was his fourth game with at least 30 points and 15 rebounds. Trevon Duval dished out 11 assists for the Blue Devils, who overcame foul trouble for big man Wendell Carter Jr. When the Irish lost 88-66 at Duke in late January during a seven-game skid, Colson and Farrell were both out. So they had good reason to believe this matchup could be much different. The game began at a blistering pace, with both teams zooming up and down the court. They combined to go 8 for 13 on 3-pointers and Duke already had a 25-17 lead before the first timeout 7:18 in. Allen was 4 for 4 from outside the arc at that point, hitting three straight before Notre Dame coach Mike Brey called a timeout. With the Irish playing their third game in three days, this one against a rested Duke squad that had been off since beating rival North Carolina on Saturday night, the fast start seemed to favor the Blue Devils as they built a 13-point advantage midway through the first half. But the Irish trimmed that to 41-37 at halftime - despite Allen's 17 points - and quickly got within two 40 seconds into the second. That's when Duke took control as Bagley and Duval combined for 10 points in a 12-2 spurt that gave the Blue Devils a 53-41 cushion. Duke extended it to 80-62 with 4:30 remaining, and there would be no big rally for the Fighting Irish on this night. Notre Dame won its first two games in the tournament, erasing a 21-point deficit in the second half Wednesday night against Virginia Tech for the biggest comeback in school history. Duke is 7-0 at Barclays Center, including last year's four-game run to win the first ACC Tournament held in Brooklyn. Notre Dame is 9-3 at Barclays . Notre Dame: Hard to know how the NCAA Tournament selection committee will evaluate a team that went 14-5 with Colson and 6-9 without him. Farrell also missed several games during Colson's absence with an injured ankle. Brey said he now has a top-20 team that his stars are healthy and it deserves a spot in the field of 68. Notre Dame opened 13-3 this season and was ranked No. 5 in the country in late November after beating then-No. 6 Wichita State to win the Maui Invitational. Now, the Irish must hope they did enough with Colson and Farrell in the lineup to impress the committee. If not, Notre Dame could be a favorite to win the NIT. Duke: With a chance to earn a No. 1 seed in the NCAAs, the Blue Devils are looking for their second consecutive ACC Tournament championship. They already have a record 20. ... Duke improved to 100-44 in the ACC Tournament, including 62-22 with 14 championships in 38 appearances under coach Mike Krzyzewski. ... Since switching primarily to a 2-3 zone defense, an uncharacteristic move for Krzyzewski, the Blue Devils have won seven of eight. Before that they had dropped three of four. Notre Dame: On the bubble, and a big story, when Selection Sunday rolls around. Duke: A semifinal matchup with Miami or North Carolina.